We just wanted to take a moment to extend our thoughts and love to the people in Brussels and those affected by the terrible attacks that took place. It is during times like these that we are continuously reminded that when it comes down to it, we are all humans. We’re all on the same team. We are reminded of how thankful that we have one another, no matter where we live in the world…and that we’re all part of the same very large, somewhat dysfunctional, but still very much loved family. That is why it really took us both back, and quite frankly completely appalled the both of us to see so many jump to condemn DDHQ and/or anyone they assume to be the one posting for making a mistake this morning by posting songs and images that some felt were inappropriate in light of today’s events. Sure, the choices were unfortunate – but still just an error like any other, and we ALL make those kinds of mistakes every single day. We caution those of you who seemed bound and determined to not only make DDHQ say they were sorry, but to also admit that they had failed, as if that was going to somehow make the situation better. On a day such as this, when the world was waking to another time of horror, couldn’t we cut everyone some slack? Be the bigger person? Be gracious instead of point fingers?? Don’t forget, they’re also trying to plan a European tour, get the band and their equipment off for this one starting on Friday, coordinate their press, and thousands of other large and small details. Yet they took the time today to acknowledge a vicious attack, and then came out and apologized for making an error. And you never know whom you’re really calling out for these errors, we might add. Would you talk that way to a band member??? Daily Duranie has been at the receiving end of negativity such as this before, and we’re going to be blunt: IT IS COMPLETE BS. There’s no reason for it. 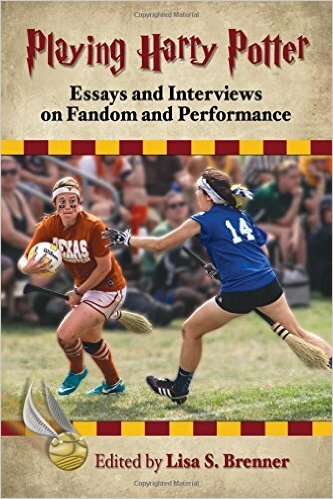 No one looks cool for doing it, and it still isn’t going to make anybody look like the better fan – in fact, we’d say it does the opposite. DDHQ makes mistakes sometimes. So do we. In fact, we make them a lot. We’re all on the same team when it comes down to it, though. We’re all supporting Duran Duran in one fashion or another, and I’d hate to see that stop purely because people are constantly getting called out for making a mistake. It takes something that should provide joy, love and even some comfort, and instead makes it feel very brutal. No one wants that. We’re all in this together. Let’s remember that and stand together. DDHQ does a great service for all of us, because they certainly don’t HAVE to engage with fans…plenty of bands just don’t, and judging from outbursts like what we saw this morning, we can see why. We’re pretty glad we’re supporting them, that’s for sure. I don’t even know where to begin! It was a crazy week!!! 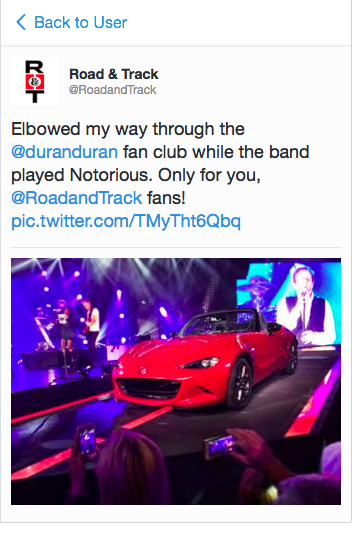 The biggest event was Duran Duran’s performance at the unveiling of the latest Madza Miata on Wednesday, September 3rd. This event and everything surrounding the event led to quite of bit of activity in the Duran universe. Frankly, I’m still reeling from all of it! I’ll do my best to summarize all that and more! Did you miss Duran’s performance at the Madza private gig? Did you miss Rhonda’s blog post about it? Can’t find it on YouTube? Simply go here to see the video and read about Rhonda’s reaction to the whole deal! You could also check out duranduran.com for a few pictures! Now, many people expressed concern about Anna Ross since she was not at the performance in Monterey, California. Apparently, she had hurt her back and was unable to travel. We hope that she is feeling better!! Of course, a lot more went on within the fan community due to that particular show. Let me break it down for you and in no particular order. Since Duran Duran were hired by Madza to play at this private gig and had performed recently in Moscow for a pharmaceutical company, many opinions about playing for corporations were voiced among the fan base. Rhonda entered her opinion on this blog post. The debate raged on. My question is this. Is Fashion Rocks different? Is the Grand Prix Formula1 event different or are they all corporate gigs? During the actual event, there was quite a bit of activity on both Twitter and Facebook as we hosted a viewing party. If you wanted to check out the action on Twitter, the hashtag used was #DDMadza whereas the action on Facebook could be found on the event page. While there was much frustration by the back-up singer, possible sound problems, Duran not having the best performance, only being able to see 3 songs and more, people seemed to enjoy reacting with other Duranies! I know that I did! We thank each and every person who participated!!! Then, of course, there was quite a bit of discussion about a certain retweet by Duran Duran, which you can read about in this post. Some people were offended by it and others weren’t. I have already made my point with the post but here’s the thing. Wouldn’t it be nice if retweets didn’t offend ANY FAN even if it didn’t bother you?! Can’t we all agree to that?! Of course, not all of the discussion after the fact had to do with the retweet, performance, corporate gig. Oh no, there was quite a bit of discussion on OUR twitter on Friday afternoon about a certain shot during the performance of a certain bass player and his anatomy. It seemed that my dear friend, Rhonda, forgot who was the John Taylor fan around here! (Oh no, I won’t forget that anytime soon, Rhonda!) If you are interested in THAT discussion, you should be following us on Twitter (@DailyDuranie). Seriously, what did I miss in this summary? !